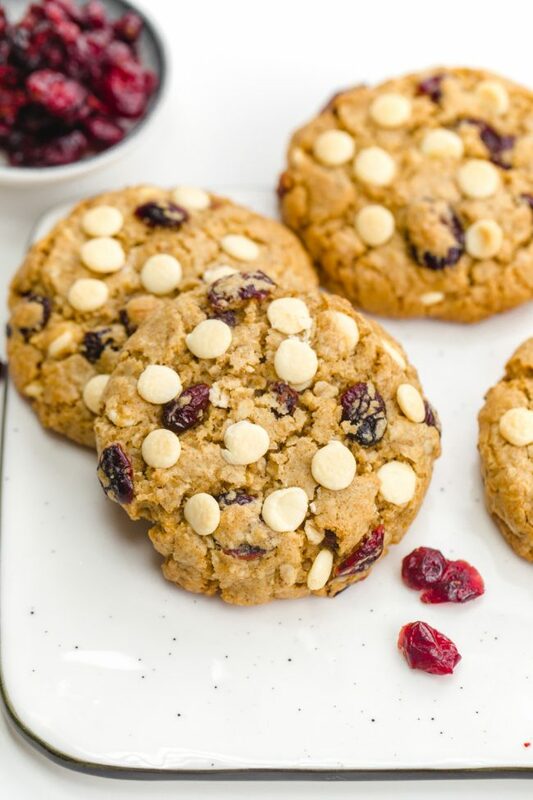 White chocolate cranberry cookies that are soft and chewy and packed with white chocolate chips and dried cranberries. With vegan, gluten-free and whole wheat options. Today’s white chocolate cranberry cookies are so festive and perfect for Christmas. I make them every year! For the flour, you’ve got several options. You can use whole wheat flour, whole spelt flour, or all-purpose flour for the folks who can have gluten. 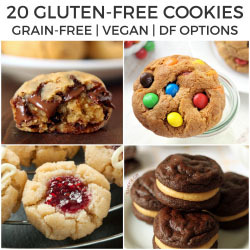 For the gluten-free version, you can use this 1-to-1 GF Baking Flour OR a combination of white rice flour, tapioca flour / starch, potato starch and xanthan gum. With the store-bought baking mix, there’s just the tiniest hint that the cookies aren’t made with all-purpose flour. With my homemade mix, you can’t tell at all. But both versions are awesome! I actually forgot about that homemade gluten-free baking mix. I used it in these molasses cookies (which can also be made whole grain + vegan! ), blueberry cookies, apple upside down cake, apple brownies, and this caramel apple cake. There’s no way to make these grain-free but I do have a paleo oatmeal cookies recipe that you could use. The ingredients list isn’t as short as I’d like but I think the other reviewers would agree with me that they’re worth dragging out the few extra ingredients! 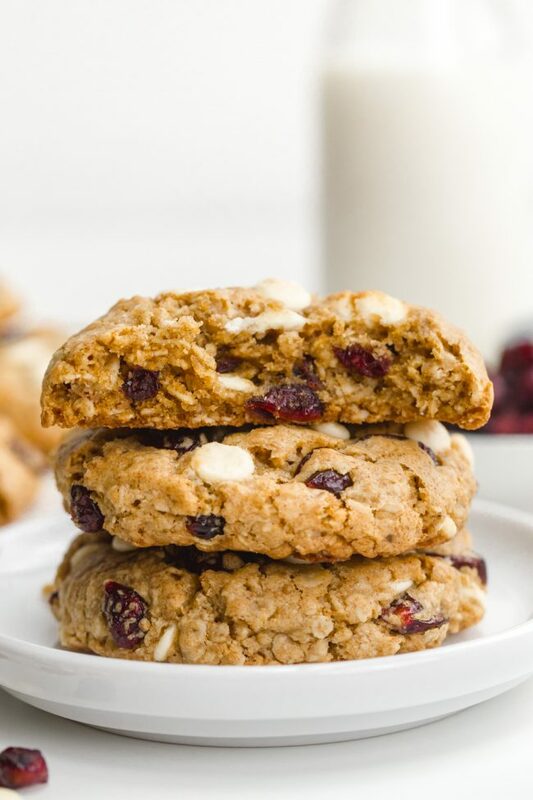 These cranberry oatmeal cookies are perfectly soft and chewy no matter how you make them. Chia eggs work great for a vegan version. And make sure to use vegan white chocolate, like King David. 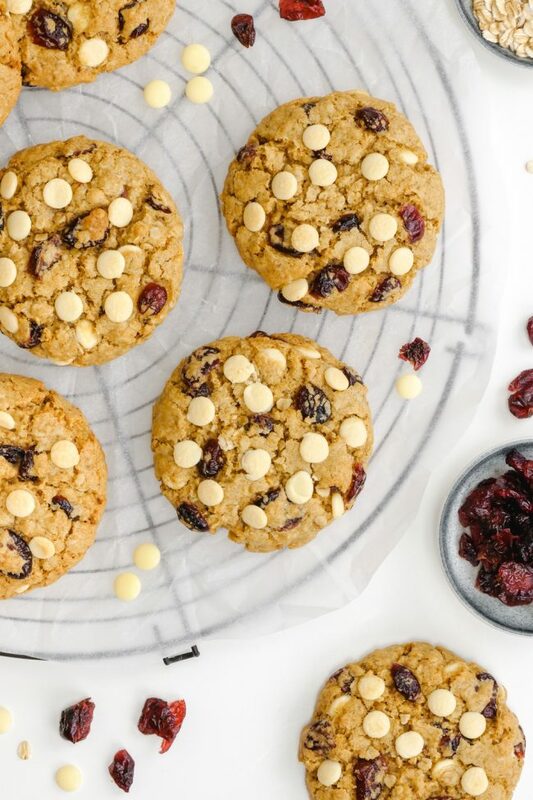 If you’re not too wild about the ingredients in those, semi-sweet chocolate chips + cranberries is also a delicious combination! Or has anyone tried making homemade vegan white chocolate that actually tastes good and can be used in baking? I’d love to try it! I used a bit of cinnamon in these cookies but orange zest + orange extract also works really well. Perhaps 2 tablespoons of orange zest and 1/2 to 1 teaspoon of orange extract (then you’d reduce 1/2 to 1 teaspoon of vanilla). If you want to add orange flavor, I’d recommend omitting the cinnamon. It just seems like too many flavors. Although I could be wrong and maybe it’s delicious! 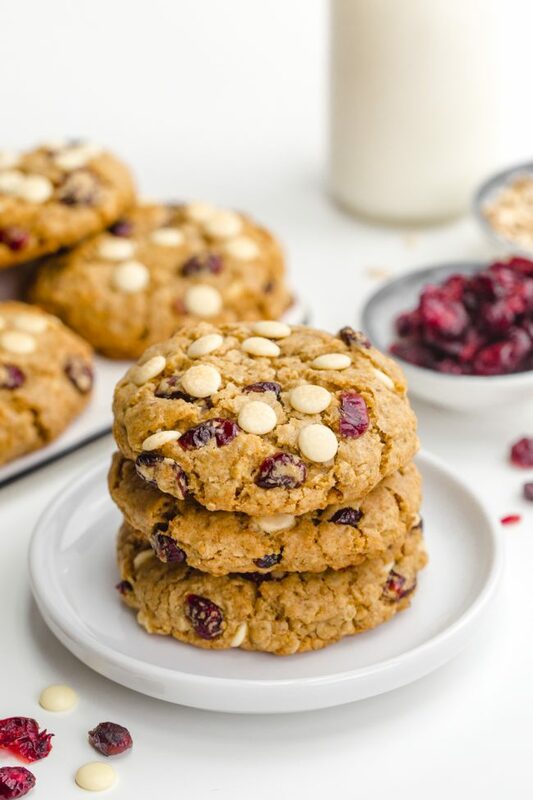 If you can have dairy, butter works in these cranberry cookies instead of coconut oil. But they’re chewier with coconut oil so I highly recommend that! I used unrefined coconut oil but couldn’t taste any coconut flavor with the cinnamon in there. If you don’t want to take the chance that there’s some coconut taste to these, be sure to use refined coconut oil. And that’s it! These cookies call for a lot of sugar (1 1/3 cups) but the yield is also pretty big. You get 16 large cookies. Double the batch for a party bring-along and you’re good to go! Add the dry mix to the wet mix and stir just until combined. Stir in the oats, raisins and white chocolate, again stirring just until combined. Bake for 13-17 minutes or until the middle appears to be set and the cookies have evenly browned. They'll still be very soft straight from the oven but firm up as they cool and sit for an hour or so. The gluten-free version might taste a bit gritty / sandy when still hot but this disappears as the cookies cool. 18 comments on “White Chocolate Cranberry Cookies” — Add one! Made em, loved em! Do you have other recipes that use the gluten free flour blend that you gave us at the end? I tried it and really liked it. I’m so happy that you liked them. 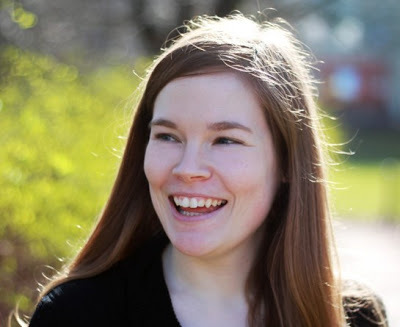 :) And yes – check out the paragraph after the second picture! I link to them there. Thanks for your comment! Wow! The flavor combo here sounds AMAZING! These cookies are jam packed with goodies! I always feel like I am the only one who wants a 2:1 ratio of goodies to dough, love that you are in the same camp! These looks amazing! I love anything with white chocolate and cranberries! Thanks for the link to the vegan white chocolate – it’s so hard to find! I just updated my big post on dairy-free chocolate chips, and realized that I have never made dairy-free white chocolate chip cookies! I need to try these – they look divine Erin. Thanks so much! And what’s the link? I’ll include it! I was just saying how I need to bake with cranberries more often!! These look great and so festive :) Love that I can make them vegan!! Gorgeous cookies! Fluffy and SO colorful! Am pinning this for holiday cookie time! This is my kind of cookie. Thick!! I don’t like thin crispy cookies unless it would be a lemon thin. HA!! Love lemon! I have better success with cookies using whole wheat or spelt and with baking powder than any kind I make. I would love the orange zest with the cranberries. I love the combination of white chocolate and cranberries! These cookies look so delicious and perfect for Christmas too!